Canada Pharmacy Online > Blog > DNA, Genetics, and At-Home Health Tests: Can You Trust Advanced Health Testing? With all the health test kits, DNA tests, ancestry services, and advanced health screening services out there today, it can be overwhelming to wade through the possibilities of what is within reason in this day and age. Can a test really tell me that? Should I order this test and find out if I have that? Should I have my baby screened in utero just to check for abnormalities? Will taking this test help protect me from that? As science progresses and humanity advances, more and more tests and procedures will fall within the realm of possibility. But are all of these tests safe? Are they helpful? What can they do for us? In this article, we’ll take a look at some of the recent advancements in genetic testing and discuss whether these are safe, ethical, and worthy of pursuing, whether personally or for medical purposes. The proliferation of genetic testing which allows us to take a closer look at our DNA and genetic makeup recently began trending and still remains in full swing. Tests from companies like AncestryDNA, 23andMe, and more have seen a huge rise in popularity, and millions of people around the world have turned to them for answers and insight into their own genetic makeup. Not only can these tests tell you about your ancestry and racial profile, they also have the ability to reveal certain insights into your medical background. Understanding the background on your genetics and knowing what illnesses you may be most susceptible to can help you to prevent or ward off certain diseases and live a healthy lifestyle optimized for your particular needs. To learn more and take a deep dive into this subject, check out our article Are DNA Tests to Discover Your Ancestry Really Safe? In this article, we explore whether your sensitive information is truly safe in the hands of large corporate moneymakers. Did you know there is such a thing as genetic autism testing? This is useful in identifying exactly what sort of mutation occurred on a genetic level that resulted in autism. While genetic autism testing is more common in Europe, it is not often used in the United States. Europe is now focused on studying autism more scientifically, as evidenced by their plans to build sequencing facilities, create databases of their research, and then use the genetic testing results to incorporate into standard healthcare. Are people obligated to share the results of their genetic testing? A desire for privacy in the larger scientific community may be understandable (though the information is invaluable for the advancement of humanity) -- as there is a risk of genetic discrimination or worse, after all -- but what about with family? Are people morally bound to disclose any genetic anomalies or predispositions to members of their family? Some countries treat this sort of information more sensitively than others, even across Europe. In Switzerland and the Netherlands, for example, insurers are allowed to consider the results of genetic tests when they craft life insurance policies. And in Norway, people may have to pay more for their health insurance if they have certain genetic mutations. However, in Germany, information like this is kept so confidential that are not even allowed to discuss a child’s results with his or her other doctors, unless the parents provide written consent. Regardless of the sensitivity of the information and the confusion on what to do with it, most can agree that genetic testing for autism and other conditions is helpful and should become more commonplace. Genetic autism testing may somewhat rare now, but for the sake of the people and families affected by autism, we can only hope that it will become more commonplace as time goes on. And this leads to a possible moral and ethical dilemma. If we screen newborns or perform prenatal testing and discover that there are issues, what should we do about it? Or, if we have the power to alter an unborn person’s genetic code while they are still in utero, should we take advantage of it? To learn more, check out our article A Modern Science Dilemma: Is It Ethical to Edit the Genes of Unborn Babies? A relatively new company that offers a wide variety of home health testing kits is growing in popularity and making headlines, especially after they appeared on the hit TV show Shark Tank. Some examples of EverlyWell’s home health testing products include food sensitivity tests, postmenopause tests, women’s fertility tests, heart health tests, HbA1c test, a cholesterol and lipids test, Omega-3 tests, and even sexually transmitted disease tests -- and that’s just to name a few. The tests range in price. These tests can be extremely helpful and assists the patient in taking their health into their own hands. Men’s Journal even wrote about how athletes can use these tests to optimize their health and athletic performance. However, some people wonder if these tests are truly trustworthy and legitimate. According to EverlyWell’s website, “partner labs are the same laboratories used by hospitals and physicians around the US” and are CLIA-certified. They also conduct original clinical research. It’s likely that consumers will see an uptick in more tests like this hitting the market. The more people can take their health into their own hands -- and decrease long lines, dragging waits, and lack of clear communication at health centers and doctors offices -- the better the outlook for patient care and disease management. In fact, it has been reported that even Amazon is exploring the possibility of introducing home health testing kits. They recently acquired Confer Health, a startup that develops hardware and materials for at-home medical testing, which gives consumers to view their test results in a matter of minutes rather than days. While rumors swirl about Amazon’s possible entrance into the health diagnostics space -- where some of its main competitors would be EverlyWell, Quest, and LabCorp -- one thing is clear: this is a market that’s on the rise, and big companies are taking notice. Did you know there are known genetic markers that impact your metabolism or response to a drug? One company in particular is taking this ability and running with it, giving users a way to more quickly and painlessly find their way to a prescription regimen that works for them. This new product in the world of health testing allows you to order a genetic test kit for your prescriptions and medications. 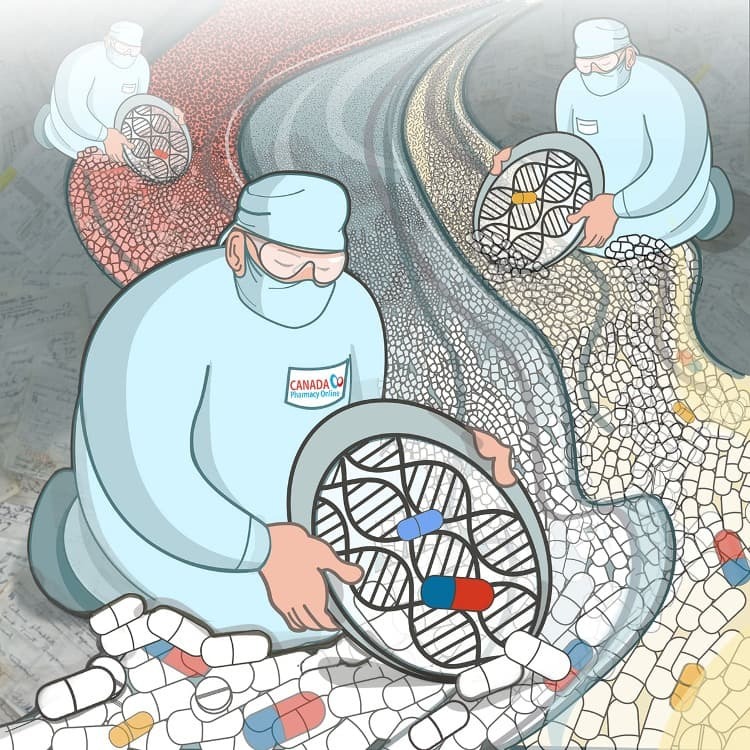 LifeLabs Genetics in Canada offers what might be a new frontier in the world of at home genetic testing for medications: the TreatGxPlus pharmacogenetic test allows you to optimize your medication journey by shortening the time and process it takes for patients to reach their appropriate medication and dosage regimen. These tests sometimes just lead to more testing, as they cannot always determine exactly the optimal prescription for a patient, but they certainly provide a leg up and more helpful information than not having it. Quality prescription meds are also an important part of the healing process. Reach out to us if you need help to order prescription meds safely. Another new health test that’s making progress is a test for sepsis. According to the BBC, “A new rapid test for earlier diagnosis of sepsis is being developed by University of Strathclyde researchers.” Sepsis sometimes involves a fatal consequence, especially when diagnosis is delayed, so being able to diagnose it more quickly than ever has serious potential to save lives.